Mango is adaptable to a wide range of climate and soil conditions and grows well from sea level up to about 1500 m above mean sea level. It withstands both fairly dry conditions and heavy rainfall. Alphonso, Kalapady, Neelum, Mundappa, Pairi, Baneshan, Alampur Baneshan, Mulgoa, Suvarnarekha,Banglora, Bennet Alphonso (Sindhuram), Prior (Priyur), Muvandan, Vellaikolamban (Kolambu mavu), Chandrakaran (Juicy/ suitable for tender mango pickle) . Stone grafting is successful in mango. August is ideal for the operation. Select four month old scion materials. Defoliation of scion shoots 10 days prior to grafting is beneficial. Grafting of 8 cm long scion on rootstocks at a height of 6 to 8 cm is most successful. The dieback disease of grafts caused by Colletotrichum can be controlled by spraying 1 % Bordeaux mixture. Inarching/ approach grafting: The method consists of uniting the selected shoot (scion) of a desired parent tree (mother plant) with the potted or transplanted seedling (rootstock) by approach grafting. For this purpose, about one-year-old seedlings of about 30-45 cm height and thickness ranging from 0.75 to 1.5 cm is taken. Young and non-bearing trees should not be selected as mother plants. Inarching should be done during the growing period when the tree is in active sap flow condition termed as active growth period. The end of the monsoon in heavy rainfall areas and early monsoon in the light rainfall areas is the best period for inarching. However, it can be done any time between July and February. Veneer grafting: For conducting this grafting operation, a downward and inward 30-40 mm long cut is made in the smooth area of the stock at a height of about 20 cm. The scion stick is given a long slanting cut on one side and a small short cut on the other so as to match the cuts of the stock. The scion is inserted in the stock so that the cambium layers come on the longer side. The graft union is then tied with polythene strip as recommended for inarching. After the scion takes and remains green for more than 10 days the rootstock should be clipped in stages. Budding : Although success of budding in mango was reported in the beginning of this century, budding still continues to remain in experimental stage as far as commercial mango propagation is concerned. Stone Epicotyl grafting : It is a new technique of mango propagation. This method is simple, cheap and quick. Fresh mango stones are sown in the nursery beds. After germination, seedlings with tender stems having coppery leaves are lifted with stones still attached. The roots and stones are dipped in 0.1 per cent Bavistin solution for 5 minutes after washing the soil. The seedling stems are headed back leaving 6-8 cm long stem. A 4-6 cm longitudinal cut is made running down through the middle of the stem. A wedge shaped cut starting on both sides is made on the lower part of scion stick. The scion stick should be 4-6 months old and 10-15 cm long having terminal buds. The scion stick is then inserted in the cleft of the seedlings and tied with polythene strips. The grafts are then planted in polyethylene bags containing potting mixture. July is the most suitable month for stone grafting. Soft-wood grafting : The technique of soft-wood grafting is similar to that of cleft or wedge grafting. In this case, grafting is done on newly emerged flush having bronze coloured leaves and stem. This method is useful in in-situ grafting. The scion wood to be used should be defoliated 10 days prior to the grafting and having same thickness as that of terminal shoot. The graft should be secured firmly using 1.5 cm wide and 4.5 cm long, 200 gauge polythene strip. July and August are the best months for soft-wood grafting. Air layering : Air layering can be done successfully in mango using IBA or NAA 10,000 ppm in lanolin paste. Success up to 50 per cent has also been obtained by using Seradix-B as root promoter. The air-layers can be used for permanent planting or for raising uniform rootstocks. Plant one year old grafts with the onset of monsoon showers so that they get established before the rains. If rainfall is heavy, planting should be done during August-September. Select good grafts for planting. Planting can be done according to the square system or hexagonal system. Prepare pits of size 1 x I x 1 m at a spacing of 9 m one month before planting and allow to weather. Refill pits with mixture of topsoil and 10 kg of compost or FYM per pit to a level higher than the adjoining ground. Plant the grafts at the same depths as they were in the containers, preferably in the late evening. Deep planting results in poor growth of the plant. Ensure that the graft joint is above the soil level. Tie the plants to stakes to prevent snapping at the graft joints. Green leaves (25 kg/plant) and wood ash (10-15 kg/plant) may be applied additionally. Apply organic manures in May-June with the onset of monsoon. Apply the fertilizers in one dose during May-June until bearing stage and thereafter in two equal split doses, the first during May-June and the second during August-September. Apply manures and fertilizers in trenches 30 cm deep taken at a distance of 2.5 to 3 m from the base of the tree. Amount and frequency of irrigation depends upon the type of soil, prevailing climatic conditions, especially rainfall to be given, and its distribution and age of trees.. During the first year the plants are to be watered every 2-3 days in the dry season. Trees in the age group of 2-5 years should be irrigated at 4-5 days interval. The irrigation interval could be increased to 10-15 days for 5-8 years old plants during dry season. When trees are in full bearing stage, generally 2-3 irrigations are given after the fruit set. Profuse irrigation during 2-3 months proceeding the flowering season is not advisable. Irrigation should be given at 50 per cent field capacity. Grow vegetables, horse gram, black gram, pineapple and banana as intercrop in young orchards. Carry out intercultural operations by ploughing or digging twice during the year in June October. For reducing fruit drop and to improve productivity, NAA at 10-30 ppm concentration may be sprayed to the entire inflorescence at the peak stage in the second week after fruit set. Immediately after planting the mango, the weed problem may not exist, but it is advisable to break the crust with hand hoe each time after 10-15 irrigations. However, subsequent hoeing may be done depending on weed growth in the basin. Interculture operations are equally important for the bearing mango orchards. First ploughing should be done before the onset of rains. This will help in checking run-off losses and facilitate maximum retention of water in the soil. Orchard may be ploughed again after the rainy season is over in order to suppress weed growth and to break capillaries. Third ploughing may be done in the last week of November or first week of December with a view to checking the population of mango mealy bugs. Due to wide spacing and developing root patterns, the large unutilized interspace can be exploited for growing inter and mixed crops successfully. The soil fertility can also be maintained / enhanced by careful selection of intercrops and adequate management of the orchard. This enables the orchardists to raise extra income during the years when the main crop yields no / low returns. Selection of intercrops depends on agroclimatic region, marketing facilities, levels of inputs and other local considerations. 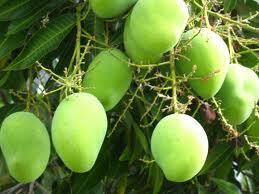 In general, 40-45 years old mango trees exhibit decline in fruit yield because of dense and overcrowded canopy. The trees do not get proper sunlight resulting in decreased production of shoots. The population of insects and pests built up and the incidence of diseases increases in such orchards. These unproductive trees can be converted into productive ones by pruning. Intermingling, diseased and dead branches are removed. Thereafter undesirable branches of unproductive trees are marked. At the end of December, these marked branches are beheaded at 1.5 to 2.0 meter from distal end and the cut portions are pasted with copper oxy chloride solution. During March-April, a number of new shoots emerge around cut portions of the pruned branches. After two years of pruning new shoots comes and the yield of fruit increases gradually. The important pests of mango are hoppers, stem borers, shoot midges, leaf feeding insects, fruit flies and psyllids. To control mango hopper, spray malathion 0.1 % at the time of flowering. To control mango stem borer, apply paste made of crude carbolic acid (130 ml), soft soap (1 kg) and hot water (3.7 litres) to holes in the bark and plug the holes. To control fruit fly, spray malathion 0.1 % emulsion / suspension containing 2% sugar. Collect and destroy attacked fruits that rot and drop down. Fruit flies can be effectively managed by keeping Ocimum trap @ 4 / tree and collection and destruction of fallen fruits by taking deep pits having at least 60 cm depth. Setting up of pheromone trap (methyl eugenol trap) @ 1 trap per 15 cents, swabing the tree trunk with jaggery 10% containing malathion 0.1% @ 1 litre/ tree during fruiting season at fortnightly intervals, soil application of B. bassiana formulation @ 10 litre solution/ 40 m2 under tree canopy (20 g/ litre) during fruiting season and post-harvest treatment of harvested fruits with lukewarm water @ 480C containing 1% salt for 15 minutes is recommended. To control shoot midge, which causes the drying of tender shoots, or dimethoate 0.05%. Apply wettable sulphur for the control of powdery mildew and anthracnose. The common diseases are the powdery mildew, anthracnose and dieback. To control dieback of twigs and branches, cut the affected twigs below the infected region and apply Bordeaux paste to the cut ends. Biennial bearing : The term biennial, alternate or irregular bearing generally signifies the tendency of mango trees to bear a heavy crop in one year (On year) and very little or no crop in the succeeding year (Off year). Most of the commercial varieties of north India, namely, Dashehari, Langra and Chausa are biennial bearers. The problem has been attributed to the causes like genetical, physiological, environmental and nutritional factors. For overcoming biennial bearing, de-blossoming is recommended to reduce the crop load in the ‘On’ year such that it is balanced in in the ‘Off’ year. Fruit drop : Despite high fruit set initially, the ultimate retention is quite low in mango. The intensity of fruit drop, varies from variety to variety. Among the commercially grown varieties, Langra is more susceptible to drop while Dashehari is the least. The fruit drop is more or less a continuous process and can be classified into three groups : (i) Pinhead drop, (ii) Post-setting drop and (iii) May-month drop. Embryo abortion, climatic factors, disturbed water relation, lack of nutrition, disease, pest and hormonal imbalances are the major factors that lead to fruit drop. Black tip : Black tip is a serious disorder, particularly in the cultivar Dashehari. The affected fruits become unmarketable and reduce the yield to a considerable extent. Black tip disorder has generally been detected in orchards located in the vicinity of brick kilns. Spraying borax (1%) or other alkaline solutions like caustic (0.8%) or washing soda (0.5%) is also effective. The first spray of borax should be done positively at pea stage followed by two more sprays at 15 days interval. 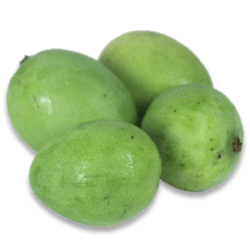 Mangoes are generally harvested at physiological mature stage and ripened for optimum quality. a) Maturity : The mango fruits should be harvested at green mature stage.The best way to observe maturity in mango is the colour of the pulp which turns cream to light yellow on maturity and hardening of the stone. b) Harvesting : The harvesting in mango should be done in the morning hours and fruits should be collected in plastic trays and kept in shades. The fruits should not be allowed to fall on the ground as the injured fruits cause spoilage to other healthy fruits during packaging and storage. Fruits harvested with 8-10 mm long stalks appear better on ripening as undesired spots on skin caused by sap burn are prevented. Such fruits are less prone to stem-end rot and other storage diseases.